We talked last week about the presidential election of eighteen hundred and four. Thomas Jefferson, the nation's third president, was easily re-elected. He was head of the Democratic-Republican Party, known today as the Democratic Party. 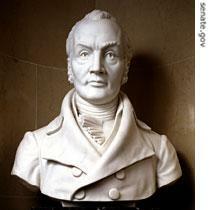 His political opponents were called Federalists. The British ambassador liked Burr's plan. He told Burr that he would urge his government to support it. It would take at least four months, however, for the ambassador to communicate with his government in London. Burr decided not to wait for an answer. He began his trip to the West. 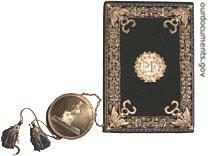 Our program was written by Frank Beardsley and Christine Johnson. The narrators were Richard Rael and Doug Johnson. Join us each week for THE MAKING OF A NATION – an American history series in VOA Special English. Transcripts, podcasts and MP3s of our programs can be found at www.unsv.com. Thomas Jefferson served as the nation' third president. The Republican won the vote in the Senate and the House of representatives. A supreme court justice Samuel Chase was put on a trial. At final he was judged to innocent. 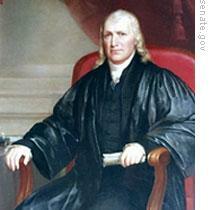 Thomas Jefferson failed in removing Samuel Chase in a Supreme court justice, though he wsa put on a trial.